Parts of me are waxed, my toes are pedicured and fingers manicured, my favorite sundress and peep-toe heels are packed and I am raring to go! We’re almost packed and ready to fly off to the warmer parts of the world. Tomorrow the three of us will be boarding the plane and heading to Dubai, leaving the icy cold and snow behind us. While Tom will return after a few days Soeren and I will be relaxing and enjoying the warmth for two whole weeks. So looking forward to seeing my parents and brother again too and enjoying home cooked Indian meals! It’s been too long since mummy pampered me! The funny thing is she calls Soeren to check out what he wants for breakfast instead of asking her eldest what she wants for lunch!! I hope to catch Beth and Komal for a few drinks and a bit of fun too and get connected with a few old school friends. Not to mention getting a fair bit of shopping done – Dubai Shopping Festival here I come. So the social calendar is filling fast! Before I leave though I wanted to post a special something for a special someone. She celebrated her big birthday yesterday and if she would have been here as it was initially planned I would have baked her a nice little birthday cake. However, we had to change our plans and so I decided to make her a few bread rolls instead. Jamie is hosting this month’s Bread Baking Day #26 and she called out to us to celebrate her birthday by baking bread for a birthday party. A party I cannot miss. A little while back I shared a very cherished recipe from my grandmother with you. Her Saffron Rice Pudding is my food recluse that I turn to when I need comforting. In that post I said that my nani’s spice was saffron – a spice she used to bestow extra love on her loved ones. That is what I am doing with my saffron bread rolls – sending a lot of love Jamie’s way for her special day. The recipe is from a fantastic book by Richard Bertinet – Dough: Simple Contemporary Breads. I tweaked it a bit to add some healthier wholemeal whole wheat flour. If you do decide to make this recipe do not be taken aback by the amount of water that goes into the recipe. It’s a lot and the dough is extremely sticky. However, without adding any further flour and just by kneading, shaping and slapping the bread dough, for what seems to be hours (35 minutes for me) it transforms into a gorgeous smooth and silky dough. According to Bertinet, the idea behind not adding a lot of flour is that by simply working the dough for a longer time and letting in more air the rolls are fluffier and softer instead of heavier and harder. And that is exactly what these rolls were. Soft, fluffy and moist, filled with a wonderful, sensual and delicate aroma of saffron. Allow the saffron strands to soak in the water. Pre-heat the oven to 250 degrees C.
In a large bowl rub yeast and both flours with your fingertips until it looks like coarse breadcrumbs or streusel. Add salt and pour in the saffron-water (all of it). Now get hold of the bowl with one hand and with the other begin mixing the flour and water with your fingers until the dough begins to come together - approx. 2-3 minutes. It will be sticky – extremely sticky but resist adding any flour. The goal here is to work as much air into the dough by just stretching, kneading and pulling. Transfer the dough to a clean and unfloured work surface. Begin working the dough by taking both your hands, like two forks, under the dough and pull it upwards towards you. Then drop it back down and give it a knead. Continue kneading – the dough will be so sticky that you can hardly work with it but as you continue it will begin to come together and become more homogeneous. Once you have a smooth elastic dough you can lightly flour the surface and form the dough into a compact ball. Place in a lightly oiled bowl and covered let it rest for approx 1 hour. Prepare a baking sheet by spreading a clean kitchen towel and lightly flouring it. Transfer the dough ball on a lightly floured surface and using your fingers spread it into a rough rectangle. From the shorter side, fold 1/3 of the dough into the middle. Press gently with your fingertips, then fold the opposite side in a similar way. Divide the dough in about 10 pieces and form each piece into a compact ball. Dust the tops with flour and with a rolling pin gently indent the tops. Place the rolls on the floured kitchen towel making sure that they are not touching each other. Use the towel to separate each roll. Cover the baking sheet with another kitchen towel and let he rolls rise for 45 minutes. Reduce the oven to 220 degrees C. Sprinkle each roll with some cumin seeds and then bake on a hot stone or a hot baking sheet for approx. 12-15 minutes. Allow to cool on a wire rack. When I make bread here it is often looked upon with a certain bit of skepticism. Living in Germany I do dot need to bake bread. In Wiemar I have a plethora of very good bakeries to choose from all making fantastic bread. However, once in awhile I will venture into bread making and when I announce it to my men – both look at each other, not understanding why I find the need to do so. But it’s true – there is no bread like homemade bread. It’s the experience, the aromas and the flavor that all come together for that better bread made in my own oven. These rolls were exquisite with the subtle aroma of saffron lingering into each bite. The cumin seeds added a spicy bite and the wholemeal whole wheat flour gave it a rustic appearance with a nuttier highlight. I’ll be catching you all on the other side sometime next week from sunny Dubai. Hopefully with a few macarons and spectacular sights and stories. Last call to vote for What’s For Lunch, Honey? at the weblog awards for the 2010 Bloggies. WFLH is one of the top five finalists in the category Best European Blog! If you have not voted yet may I please solicit your votes – you have till January 31st to vote for your favorite blogs in a huge variety of categories. Aw my lovely friend and soul sister, these are beautiful rolls for my BBD Birthday Party! I love the nutty wheat and the touch of saffron. Just perfect! Thanks so much and have a safe and happy trip. You won't believe it! I've got some dough rising for BBD as I type,and guess what it's got in it ;-) yes, saffron ( added a an afterthought).It's a different recipe though :-)Hope it comes out as well as yours! Wishing you a safe trip and lots of fun. Meeta, you aren't the only one. When we are in Singapore, every morning my mom will ask what Pierre n poppet what they want to eat for breakfast, lunch and dinner. :p Guest and grandkid come first before daughter. LOL! That's the way it is in Asian family. I always like posts about home made breads and these rolls look just perfect! An interesting flavor combo! Those healthy rools look delicious. Thsi really sounds like my kind of savory bread. I love playing around with falvour combinations- just enough for someone to ask "what is in this bread". The saffron sounds so nice! Beautiful work! The breadrolls are a delight for my eyes as is everything else on this site!!! Enjoy Dubai, must feel very very nice to go to warmer countries at this time and feel the warmth of your mother's hugs and heart too. Saffron rolls looks gorgeous, my dinner rolls are on the way to blog too. Bread making is one of the most satisfying kitchen experiences. These roll, with saffron and cumin sound terrific. Have fun in Dubai! I can imagine the shopping! 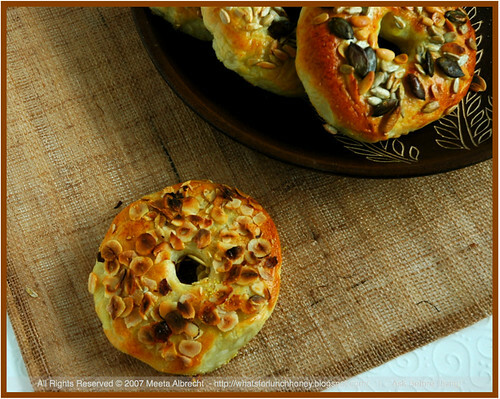 These look divine Meeta...love the addition of saffron in these savoury rolls. Beautiful! Getting away to somewhere warm sounds wonderful at this time of year. I hope you have a great time. Take lots of photos! Love the saffron in the rolls and they indeed look so beautiful and yumm. I love making breads at home as it make me relaxed. My mom is also same she ask my daughter what she likes and want, but then i think granparents like to pamper their granchildren. Enjoy the tile with your parents and looks like you will be pretty busy metting up with blog friends too. "parts of me are waxed" - you crack me up, sistah! Me too - although I will be covered in many layers all day, there is still the hot tub in the evening to consider... :) Have a fantastic time - i will be with you in spirit(s). Lovely rolls Meeta...saffron is such a wonderful spice to add to almost anything. Hope you have a great trip! Will be sending Jamie something for the BBD birthday party today myself. O I want to make some bread with saffron in it now!! the rolls look so good. Have plenty of fun Meeta. Ooooo lovely rolls Meeta. From a wonderful book. Exotic rolls! Just the thing for Jamie's party. They look so lovely and sound really delicious. I truly think that everybody should try to make bread once in their life! Enjoy your time off with your family! 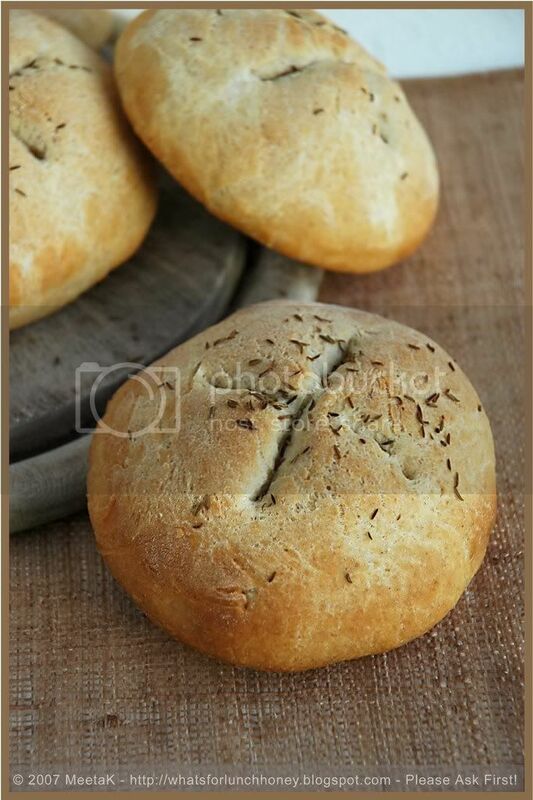 These bread rolls look fabulous!!! Waw!!! I so love the taste of saffron in my rolls,...excellent!! I also voted for you!!! I never think to use saffron in my baking, but now I'm inspired. Saffron is an aphrodisiac, so this would be perfect for Valentine's Day. These rolls look and sound delicious. It's excruciatingly painful to even look at them especially as I'm so hungry and can't wait to get some lunch! These would be perfect right now! This looks perfect for me. I have been trying to eat a lot of whole wheat products and this is an addition. Thanks! Gosh, gorgeous rolls meeta. Wholewheat and safforn! WOOT...love the sound of them. Am thinking 35 mins already...will do for soemthing as good as these! Hope you are having loads of fun in the sun!! These rolls are truly superb, nice texture and taste is awesome. Love those rolls Meeta. Have a fantastic time in Dubai!! so fun to see you use Saffron in the bread. I've been using it in brown rice to give some it some color and flavor. The shape of your buns came out perfect! To true, nothing beats homemade bread, although I usually burn my mouth because I just can't wait for my first bite. This one must taste delicious. I have tasted this one in my vacation in france. One of the hotels that i am staying is serving this.